One of my favorite things. His name is Vladimir. And he approves of this list. Enough music talk to come when we get to the favorite albums list. 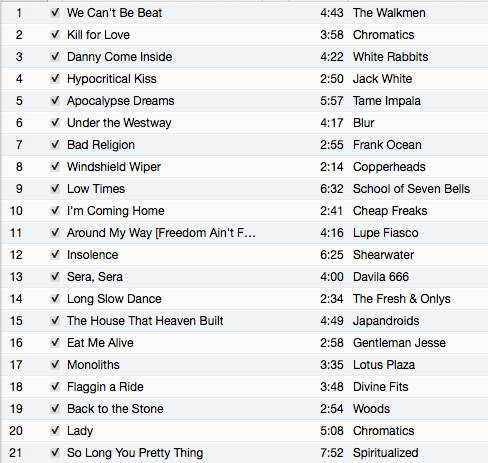 For now, enjoy my favorite songs of 2012. A lot of thought about ignoring my thoughts and going with my guts and my heart went in to this list. Some you'll know. Some you won't. Remember, discover, relish. Press the 'play' button and enjoy. *Track 16, "Eat Me Alive" by Gentleman Jesse from his excellent album "Leaving Atlanta", is currently unavailable on Spotify. It IS available on the 8tracks playlist below!